BiofusionDesign | Have you ever tried to get a refund from Amazon.com? I call Amazon and talk to Devine C. but am told that I cannot have it replaced because Iâ€™ve changed my address since the delivery. I should call the manufacturer and try to get it fixed. I call Merit Fitness about 3 times but due to the high number of calls, I am asked to leave a message and am reassured that I will be contacted within 24hrs. I am not. Someone finally answers. One hour on the phone explaining what is working and whatâ€™s not. The representative says that they will send me some parts and have a technician in my region contact me within a week. I file for half a day off work and stay at home, waiting. Nothing. I call again and am told the technician should have already stopped by. I go to the door and see a note that they were there but the bell was not working. The bell is working but even if it wasnâ€™t, why didnâ€™t they knock? Or call? I call again and they tell me that the technician will be back later. File for another half day off work. The technician comes about an hour later and after looking at the treadmill informs me that I donâ€™t have the necessary parts. He will have Merit Fitness ship the parts and schedule a new appointment within a week. No parts, no call. I call Merit Fitness again. They apologize but the defect is so expensive to fix that I am better off replacing it. They tell me I can just keep or throw away the old unit, and I should call Amazon to get a new one. They donâ€™t know why I wasnâ€™t informed about that earlier and had to call myself. I call Amazon and talk to Amanda H. I tell her I want my money back and I donâ€™t care for a replacement unit anymore. No problem, we will pick the unit up, and you will get refunded as soon as we get it. Whatâ€™s your new address? I give her my new address and she tells me somebody will call me back to schedule a pickup. No one ever calls me back. I call Amazon again and talk to Vanessa C. We schedule an appointment for Sunday so I donâ€™t miss anymore time from work, just ruin a weekend. I get a call from the shipping company to come out because they are at the address. I get out, but nobodyâ€™s there. Call them back, turns out they went to the old address. They will give me a call back in 5 minutes. One hour later, no call. I call them and they tell me thatâ€™s the address they got from Amazon. Nothing they can do about it, I should call Amazon. At this point I am pretty frustrated. I call Amazon and talk to Cassandra S. She apologizes, it was their mistake. But still, they canâ€™t give me a refund without the item. And I cannot have the treadmill picked up the same day, so we have to reschedule. So whatâ€™s it gonna be â€“ do I want to miss another day from work, or stay home one more weekend? 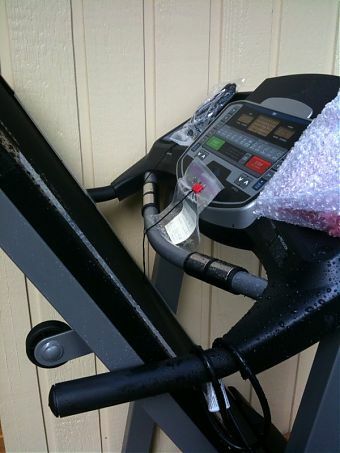 I tell them itâ€™s been two months and I want my money back, I donâ€™t care how they will pick up the treadmill. Not my problem anymore. I get to talk to the manager. Then the managerâ€™s manager. Then the managerâ€™s managerâ€™s manager whose name is Aaron D. I tell him what I told the rest â€“ I will leave the treadmill in front of the house. I live in the Seattle area so it rains pretty often, but itâ€™s not like it can get any more broken than it already is. So come pick it up whenever you want, then send me my money back. Doesnâ€™t sound like the manager cares too much about the item. Heâ€™s OK with me just leaving it outside. I will be refunded as soon as they get it, in whatever condition it might be. So there it is now, waiting to be picked up in front of my house. Itâ€™s been sunny the last couple of days so they might get lucky. I donâ€™t really care either way â€“ just want it out of my sight at this point. Three different people from a local shipping called Ceva call me to confirm the pickup date for Wednesday between 1 and 4 pm. I explain to each of them that I will leave the item at my front door. They tell me it is fine as long as I provide a note with the item number, order number and my signature. I receive a call from Amazon and they tell me that the driver couldnâ€™t pick up the item because nobody was home to sign for it. I tell her what happened. 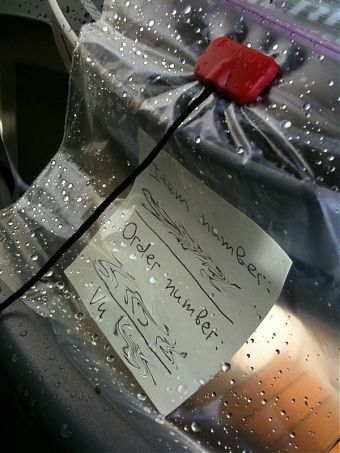 She counters back saying that the driver didnâ€™t find a note (see photo). She sounds very upset like I am trying to blame her. She asks me if I want to schedule another appointment since they canâ€™t come and pick it up the same day. I say no and end the conversation. I take another half day off work to go home and try to handle this. I call Amazon and talk to Sarah B. who is supposed to transfer me to Aaron D., but I get disconnected. I call again and talk to Kaylene who basically tells me that it is my problem and I have to call the shipping company myself. I ask her to transfer me to Aaron D. She snaps at me and tells me that we are not going anywhere with this, but agrees to transfer my call. I finally get to talk to Aaron D. who still remembers me from our conversation last Sunday. He tells me that I was supposed to leave the item outside, but in a dry area, where the driver can pick it up. It sounds like he wants me to build a little house for the treadmill or leave the key for my house. I tell him that weâ€™ve never agreed on that. At that point he tells me to call Ceva again and schedule another pickup. I call and talk to Jamie who tells me that I canâ€™t contact them directly. They will have to call me back after Amazon enters the order to schedule the pickup. So now I am waiting to see what happens next. Itâ€™s so ridiculous that itâ€™s almost entertaining.